Kids’ pages – filled with fun! A fun and interactive way of learning about personal safety. What rights do I have? I am just a child. in this country. Learn what your rights are. brothers and sisters. See if you agree with parental responsibilities here. Fun word puzzles – find the missing safety words. 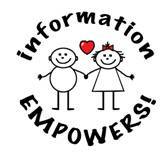 or your care-giver help you with the information. No family should be without this.